So, it's been a while since last game due to... I don't know really, maybe work? 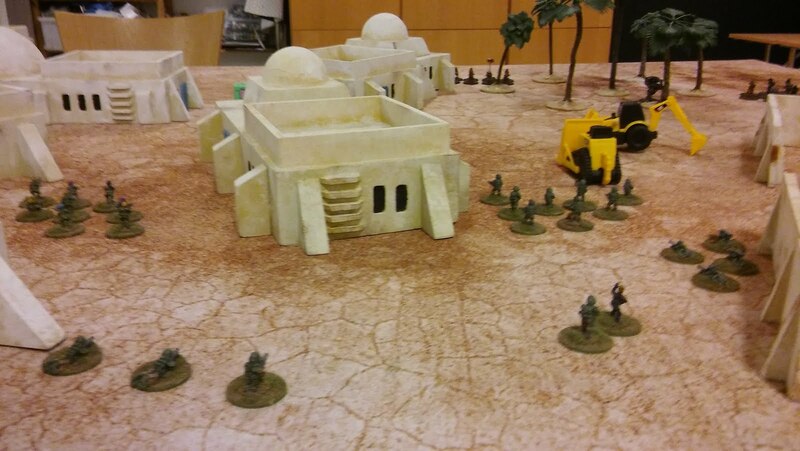 Anyway, we had a game going, our 9th of the campaign, and maybe our 12th of PMC2640. We're still liking the game, very much! All games tends to become intense mind games, which gets even more interesting since there is a great portion of luck in the rolls. It is actually a good thing, as you must have a plan B, or even C. Sometimes a unit can withstand three times the numbers, sometimes, well... you get a more disappointing result, being on the other end of the deal. 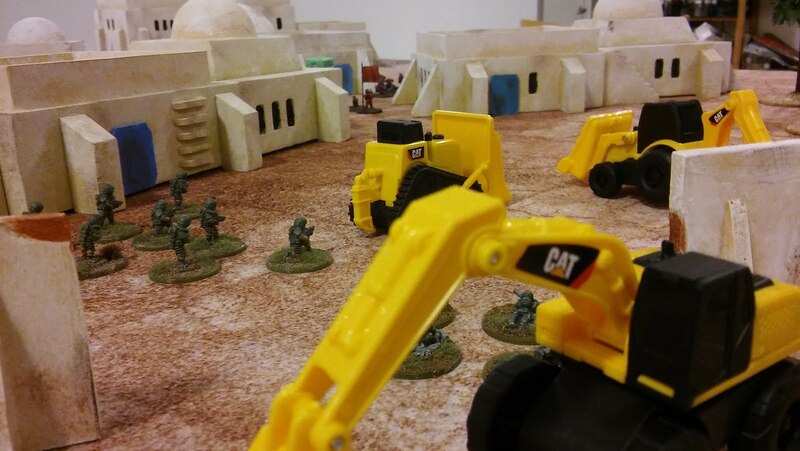 Since our last game was some kind of Tier 2,5 most of our troops needed some respite. Thus, we both didn't have that many troops to choose from. Unfortunate for these troops, they are seen as less important to us! 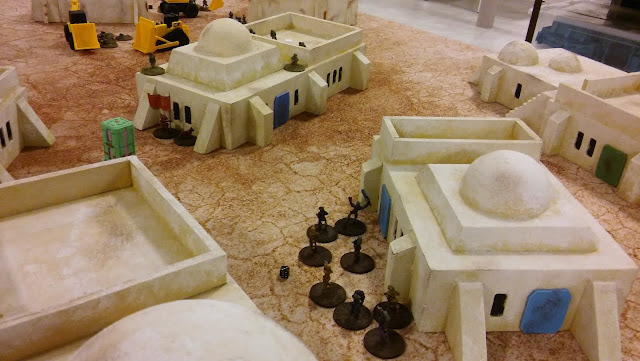 We rolled for a scenario and got 'Secure and Control' which made us battle for three positions. If any of us were able to hold all at the same turn, he will win! Otherwise, we battle until turn 20 and then check who is the winner! It seems like routing the enemy is not an option in this scenario, so it will be bloody! 2nd line, advance! The 10 man Lhurgg squad is the nomads, the other is the Blue Bandits. 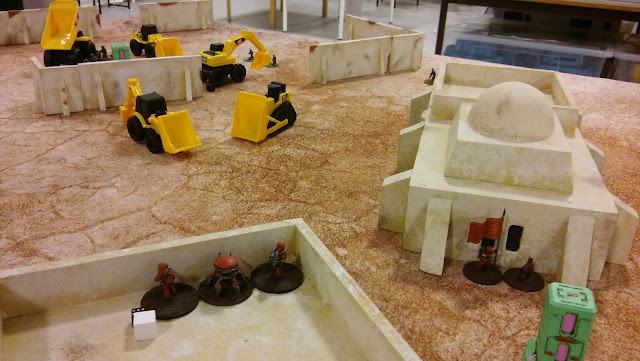 6 man 'red suits' are the engineers, 8 is recruits and the 2 man squad is the mortar. The banner holding man and the dog, you guessed it; HQ! Tier I, Field Command, Lieutenant Ruchka. 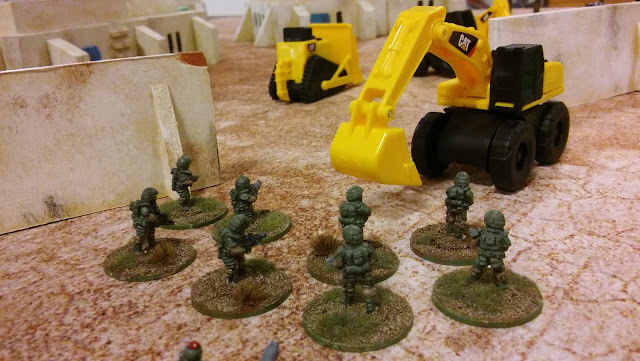 Tier III, Combat Engineers, Razing Rushers [new unit! Most welcomed!]. Tier II, Remote Mortar Section, Ground Gagarin (broken minded... making then hard to rally). Tier I, Recruits, Honour Holders. Tier I, Lhurgg Irregular Troops, Blue Bandits. Tier II, Lhurgg Nomads, Zero Zeniths. Tier II, Lhurgg Heavy Patrol Vehicle, Crepit. They were opposed by the Varuna Legion. Mortar team should be two guys (Joel the cheater!). The four being prone are the rocket armed team. The blond Rambo in the back with the sidekick is the HQ. The three man squad is the LMG team. Fancy hairstyles nominates the irregulars (of course! Irregular hair does it!). The rest is, yeah, recruits. Tier III, Rocket Armed Team. Tier II, LMG Section, Omega (bad reputation, so they can't be promoted). Tier II, Remote Mortar Section, Alpha. Tier I, Irregulars, 4th Colonial (shooting experts, giving them +1 Firepower). Tier I, Recruits, 5th Colonial. 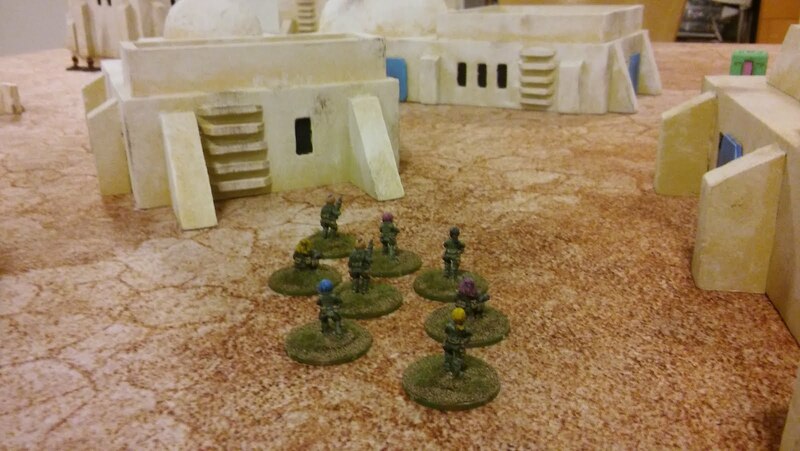 Tier I, Recruits, 3rd Assault Crew (brave, making them harder to suppress). 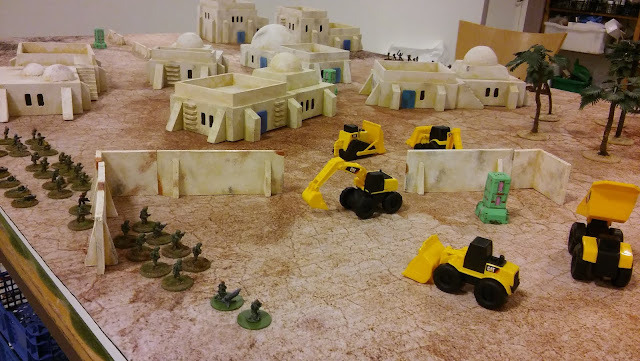 The desert (and deserted) town; Eos Misley lay before us with some new mining equipment (yes, those are toys. I will coat them and repaint them, and then it should look great!). From nearest to farthest. Mortar, recruits, HQ, brave recruits, rocket armed team, irregulars and LMG team. And the toys (I mean mining equipment!)! 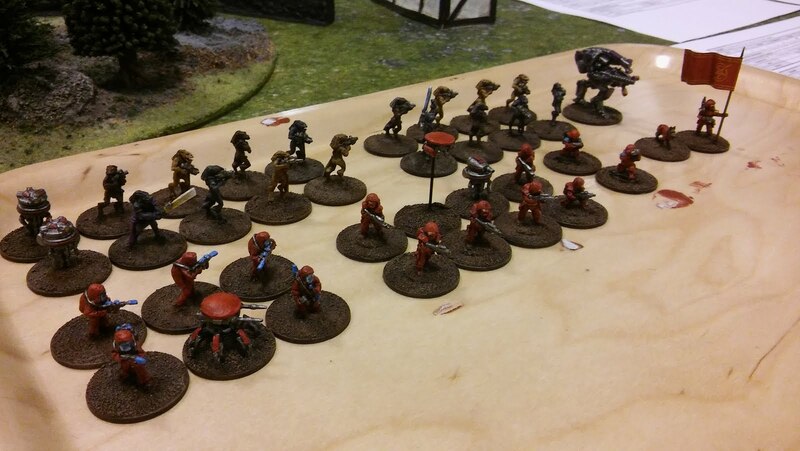 Left to right; nomads, patrol vehicle, recruits, HQ, engineers, irregulars and mortar. Advancing! 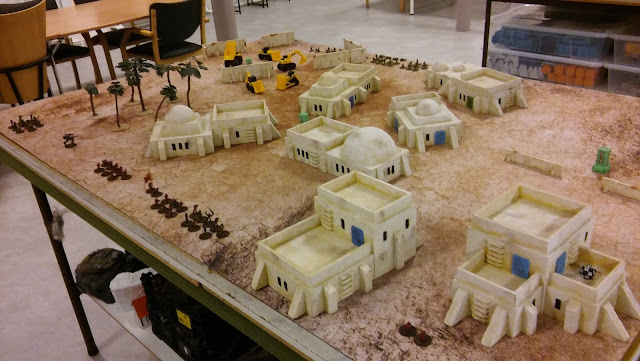 The engineers threatens any enemy units that wants to occupy the buildings, taking the center! One objective in the middle, up for grabs! 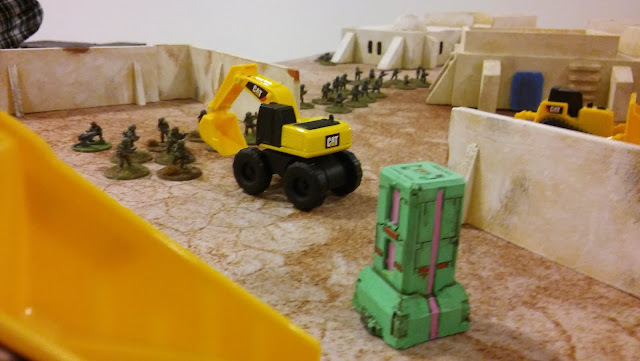 Black cubes marks activated units. 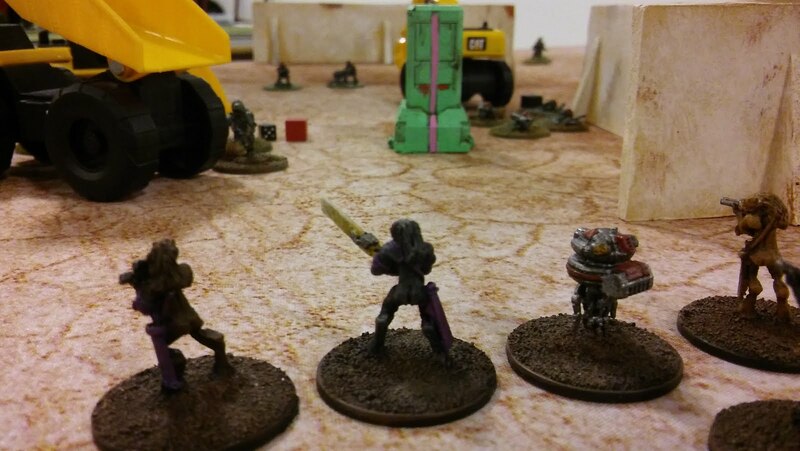 The Varuna Legion advances in tight formation, as opposed to the Sickles! The machine park holds one of the objectives. The nomads Zero Zeniths and Crepit makes an countermove. 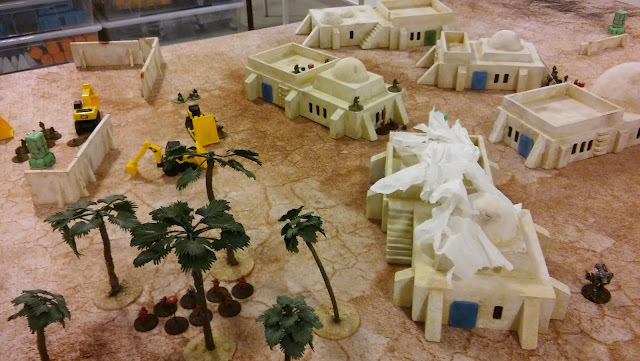 Crepit conceals itself with the woods area, and the nomads got the stealth ability. A great skill for advancing in the open! The 4th Colonials takes the far left flank for the Varuna Legion, supported by the LMG team Omega. 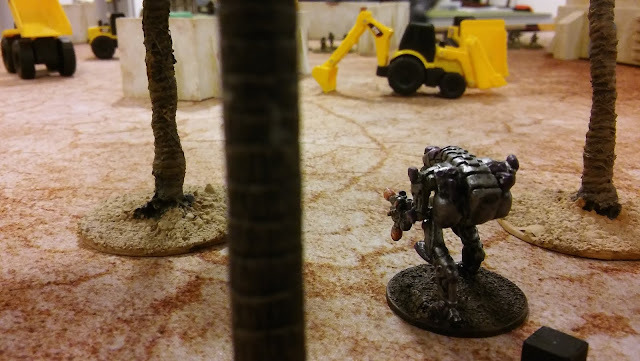 Skulking further, hoping to get the enemy mortar by surprise! The third objective on the open flank can be seen in the distance, a objective being covered by the Ground Gagarin mortar team. Ground Gagarin overwatches an objective (out of picture) and Joels watch. 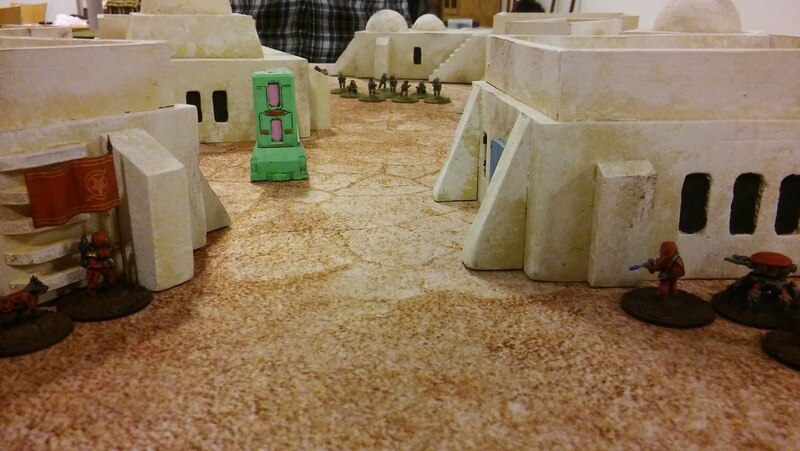 Meanwhile, the trap is set on the other flank, waiting to rip some soldiers and toys up! 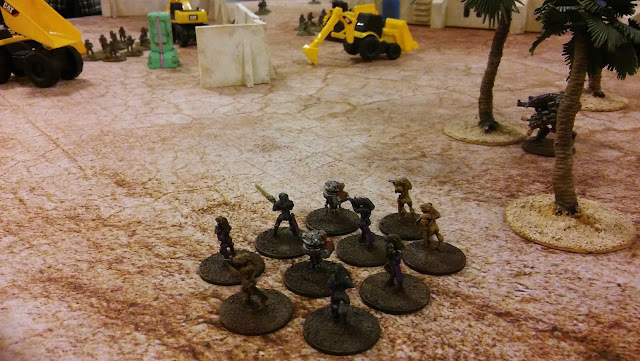 The recruits tries to find cover, realizing that an attack is imminent, thus protecting mortar team Alpha. Some recruits get to think about a new line of work, as a digging crew! In the center, the attack is set. Men and dogs alike are ready! The Varuna Legion is spreading out! First turns was all about movement and maybe a pot shot or two from the Sickles mortar, other than that, all units moved in the densely packed terrain to not be seen. In PMC, getting the first shot can be very deadly, so everyone tries to get in the upper position. That, with alternative activation, and random first player each turn, minds are melted properly! The nomads and the Lhurgg mecha pinns recruits, almost breaking them. Six engineers entered the building while captain Staya held an objective. A rocket and mortar barrage later, half of the engineer squad lay beneath the smoking paper ruins. With the left flank broken, I successfully redeployed the mecha Crepit to the center, who was going for a LMG hunt! The paper towels of smoke was a painful remainder that I've lost 7 of my 12 compositions points (points for fielding your army) in one turn! Gee... Honour Holders took defensive positions in the forest, efficientlynegating the Varuna Legions mortar, rocket team and recruits from going to the center. Honour Holders, despite being a Tier I really had Joel in a tight spot since he didn't want to take unnecessary risk his troops, since he already had the upper hand. This shows two things, 1) you don't want any more Trauma Points than necessaryin the campaign game, which makes you think more about your actions and the risk/reward aspect. 2) a low tier unit in a good position can be a great force multiplier! Fun fun! 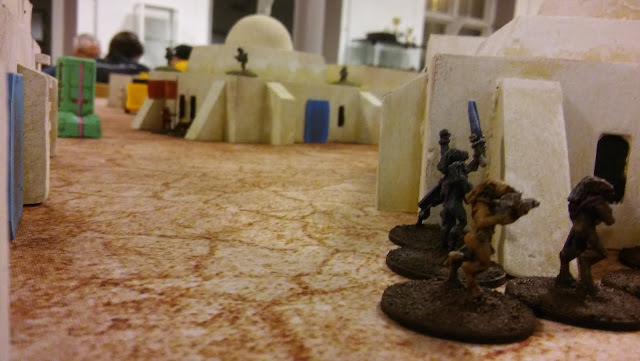 The Varuna Legion made a suprise dash, placing all bets on getting the initiative, which he did (that scoundrel!) and broke my mortar. 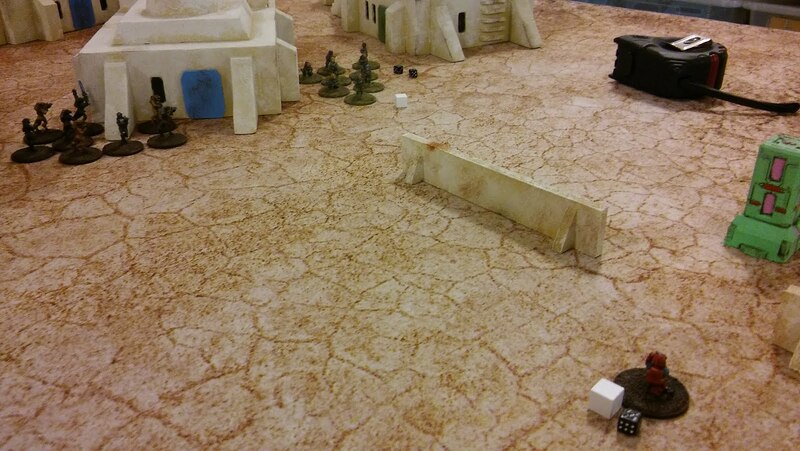 Well, it was kind of stupid of me moving the mortar team up that close (to the objective). I should've measured in beforehand. Well well, retribution came quick although I had lost 2 Compositions points to 1. So, right flank was also lost. Joel still had a LMG team behind the far house, effectively securing that flank with its massive range of 24", compared to my Lhurggs assault weapons of 12". 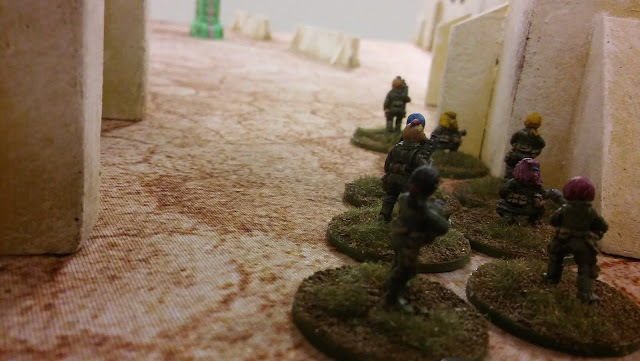 Blue Bandits now looked to the center, aiding captain Staya against some recruits. HQ units are almost unkillable, for your information. The battle for the center began! On the left side, Honour Holders held back the main part of the Varuna Legion. In the center, Blue Bandets, Captain Staya and Crepit repulsed the recruits. 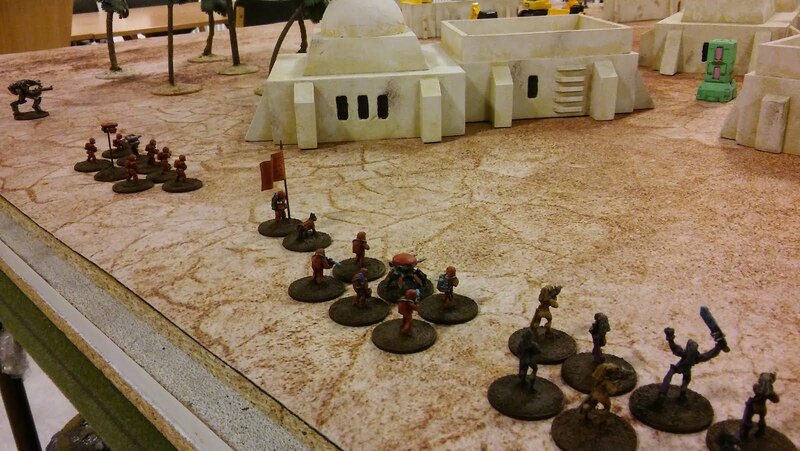 Later, Crepit went to the right flank and after some turns of fire exchange (!) 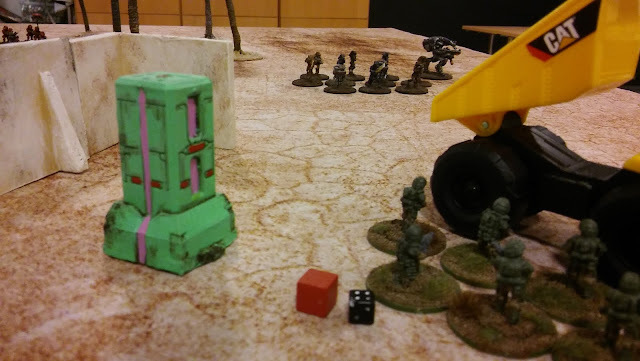 the mecha managed to cripple the LMG team. 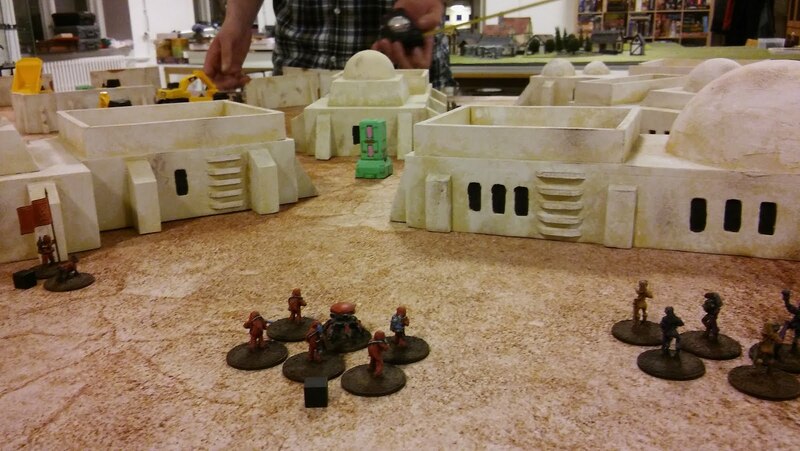 But when the threat was eliminated, I've lost Blue Bandits to rout, and had to pull back captain Staya. 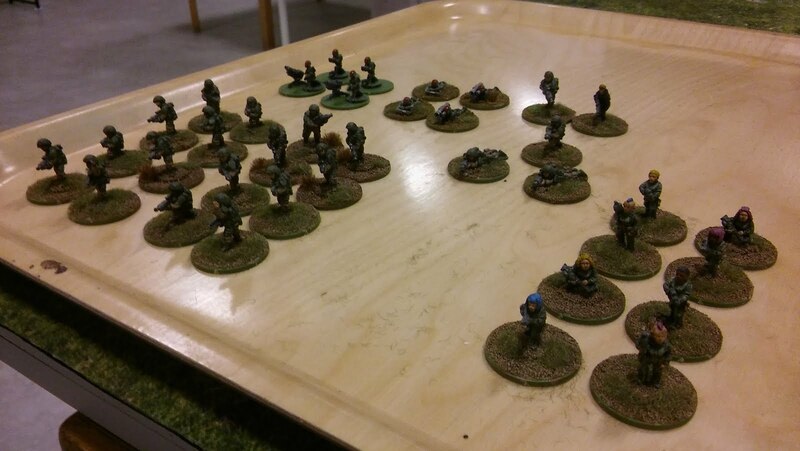 I couldn't force Joel from both the center and the right flank (since he already had the left flank secured, hard!). So, with only 4 compositions points left against Joels like 7 (?) I barelystood any chance! 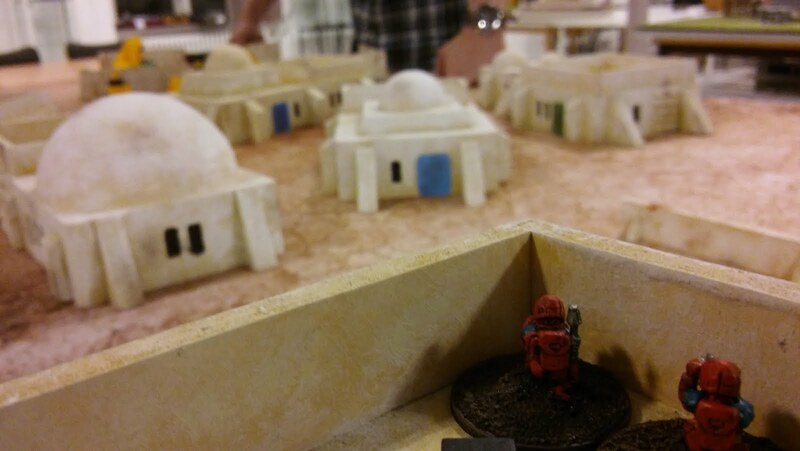 He got two out of three objectives. Scoring a win! Joel got a ton of levels, as usual! He got iron discipline on the 5th Colonial Recruits. His mortar section Alpha got 'last stand' and his LMG section Omega got 'adrenaline rush'. Gee. This is getting harder and harder for me!